Wario Land II (Nintendo Game Boy, 1998) Tested and works. 5 product ratings - Wario Land II (Nintendo Game Boy, 1998) Tested and works. PENGUIN WARS FOR NINTENDO GAME BOY COMPLETE WITH BOX AND INSTRUCTIONS! 2 product ratings - PENGUIN WARS FOR NINTENDO GAME BOY COMPLETE WITH BOX AND INSTRUCTIONS! 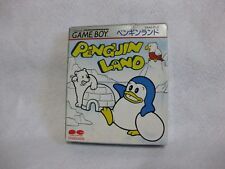 Penguin Land (Sega Master System, 1988) BOXED Game w/ CASE & Game Cartridge - !! 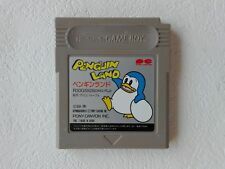 7 product ratings - Penguin Land (Sega Master System, 1988) BOXED Game w/ CASE & Game Cartridge - !! New ListingAuthentic Nintendo Gameboy Advance cartridges. Game Boy. TESTED WORKING. Choose! This page was last updated: 20-Apr 11:56. Number of bids and bid amounts may be slightly out of date. See each listing for international shipping options and costs.